Aroostook County Sheriff Shawn Gillen recently praised Rebecca O’Leary of Mars Hill for her spirit of community service. 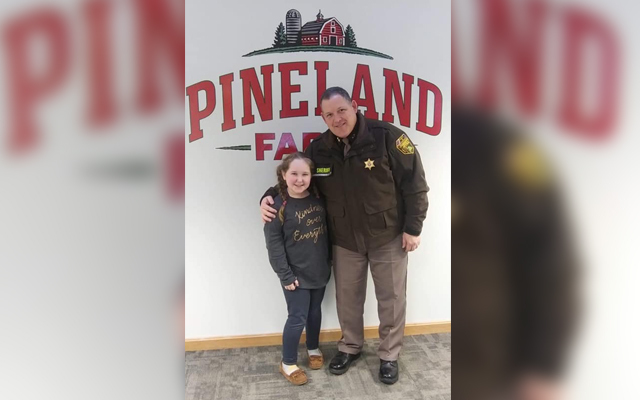 MARS HILL, Maine — Aroostook County Sheriff Shawn Gillen recently praised Rebecca O’Leary of Mars Hill for her spirit of community service. O’Leary, 9, worked with her mom Jessica to collect foods for a local food drive and purchase children’s gifts for the Toys for Tots program. She also sold a pair of skis she grew out of, and used the proceeds to buy coats to donate to Recovery Aroostook, an addiction support center in Caribou. Gillen presented O’Leary with a sheriff’s office patch and a challenge coin, thanking her for service. “I learned in Girl Scouts what was needed in my community. I didn’t want someone to be hungry or cold so I asked my mom what I could do to help,” Rebecca O’Leary said in an email through her mom Jessica, who works at the Pineland Farms facility in Mars Hill.